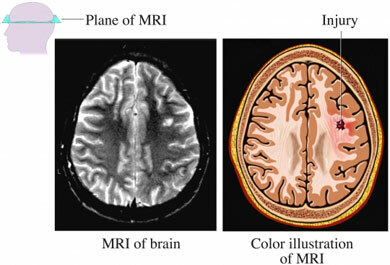 An MRI scan uses magnetic waves and computers to make pictures of the inside of the body. It can make 2- and 3-dimensional pictures. You may have an MRI scan to diagnose a problem or look for injuries. MRI scans can look at any body part. They can also be used to see if medicine or treatment is working for a disease. Make sure your doctor knows of any internal metal before the test. If you are pregnant or think you may be pregnant, talk to your doctor before the MRI scan about whether this test is right for you. A contrast dye may be used to take clearer pictures. Some people may have a reaction to this dye. Talk to your doctor about any allergies you have. Tell your doctor if you have liver or kidney problems. These problems may make it hard for your body to get rid of the dye. Follow your doctor's directions about eating and drinking before the test. This will depend on what part of the body is being viewed. Your doctor may give you a sedative medicine to calm you if you are worried about the test. If your doctor gives you this medicine, you will need to arrange for a ride home. Be sure to follow your doctor's directions on when to take it. This may be 1-2 hours before the exam. Other problems that you may have—If your MRI scan involves contrast dye, your doctor will ask about the health of your kidneys. There is a risk of problems in people who have kidney disease. Metal pieces in your eyes or in any other part of your body. Tell your doctor if your work involves metal filings or particles. An x-ray may be taken to check for any metal objects in your body. The radiologist will decide if it is safe to have the test. You will be asked to remove any metal objects such as, jewelry, hearing aids, or glasses. You will also be asked to remove all skin patches that contain medicine. They may contain metal and cause skin burns. Given ear plugs or headphones. The MRI machine makes a loud banging noise. If a contrast dye is used, a small plastic IV needle is placed into your hand or arm. You will lie very still on a sliding table. You may have monitors to track your pulse, heart rate, and breathing. The table will slide into a narrow, enclosed tube. In some machines, the sides are open, so you can look out into the room. The technician will leave the room. Through the intercom, the technician will give you directions. You can talk to the technician through this intercom. The technician will take the pictures. When the exam is done, you will slide out of the machine. If you have an IV needle, it will be removed. There are open MRI machines for people who do not like small places or can’t lie on a flat table. There are also machines that let you sit during the test. This may be an option for people with problems, such as painful back. You will be asked to wait while the images are studied. More images may be needed. If you took a sedative, do not drive, use machinery, or make important decisions until it wears off. If you are breastfeeding and get contrast dye, you and your doctor should talk about when you should resume breastfeeding. Data has not found any problems to the baby of a breastfeeding mother who has had contrast dye. The exam is painless. If you have dye, there may be stinging when the IV needle is placed. You may also feel a slight cooling feeling as the dye is injected. After the exam, a radiologist will study the images. A report will be sent to your doctor. Your doctor will talk to you about the results and any further tests or treatment. Expert Panel on MR Safety, Kanal E, Barkovich AJ, et al. ACR guidance document on MR safe practices: 2013. J Magn Reson Imaging. 2013;37(3):501-530. Magnetic resonance imaging (MRI)—body. Radiology Info—Radiological Society of North America website. Available at: https://www.radiologyinfo.org/en/info.cfm?pg=bodymr. Updated May 24, 2016. Accessed March 14, 2018. 5/17/2014 DynaMed Plus Systematic Literature Surveillance http://www.dynamed.com/topics/dmp~AN~T114252/Routine-prenatal-care: Patenaude Y, Pugash D, Lim K, et al. The use of magnetic resonance imaging in the obstetric patient. J Obstet Gynaecol Can. 2014;36(4):349-355. Available at: https://sogc.org/wp-content/uploads/2014/04/gui306PPG1404E.pdf.